The Backlights for LCD Displays are White LEDs, which are made by using a Blue LED together with a yellow phosphor to transform some of the light for the Red and Green primaries. The spectrum of an LCD display is just the spectrum of its white LED Backlight filtered through the individual Red, Green and Blue sub-pixel color filters within the LCD panel, resulting in broad rolling spectra for LCDs. OLED Displays are emissive devices so their spectra are just the sum of the individual Red, Green and Blue OLED spectra, modified slightly by the touchscreen layer and anti-reflection absorption layer through which their light must pass. As expected the Galaxy Note7 OLED spectra are relatively narrow with deep notches between the primaries, which results in highly saturated colors that are adjusted with display Color Management to improve image color accuracy. 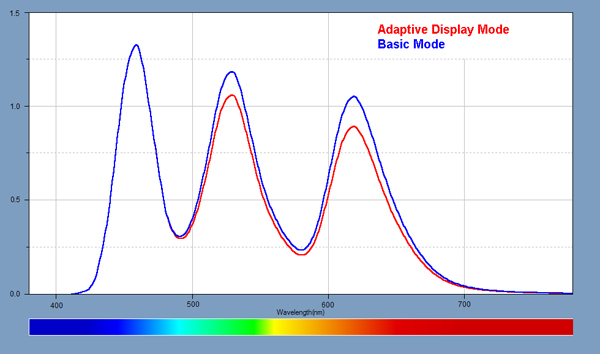 The difference in the relative heights of the Green and Red Primary peaks for the Adaptive Display and Basic Screen Modes in Figure 4a below is due to their different White Point Color Temperatures, which requires different drive levels for each primary. 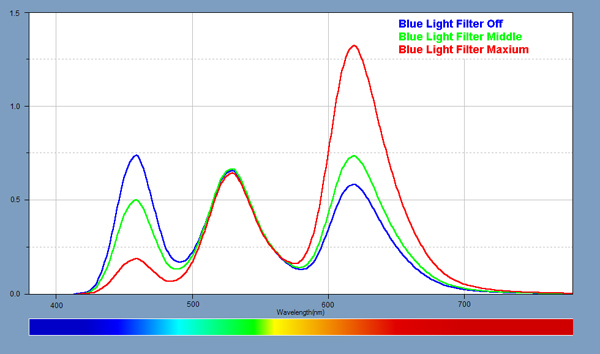 Spectra for the Adaptive Display and Basic Screen Modes. The Blue Light Filter is designed to change the color balance of the display in order to reduce the amount of Blue Light produced by the display, which some recent research indicates can affect how well users sleep afterwards. As the Blue Light Filter Opacity setting is increased, the amount of Blue Light emitted by the display decreases, which is seen in Figure 4b below. With the Blue Light Filter at its Maximum setting, the Blue Light component is reduced by 80 percent. Copyright © 1990-2016 by DisplayMate® Technologies Corporation. All Rights Reserved.